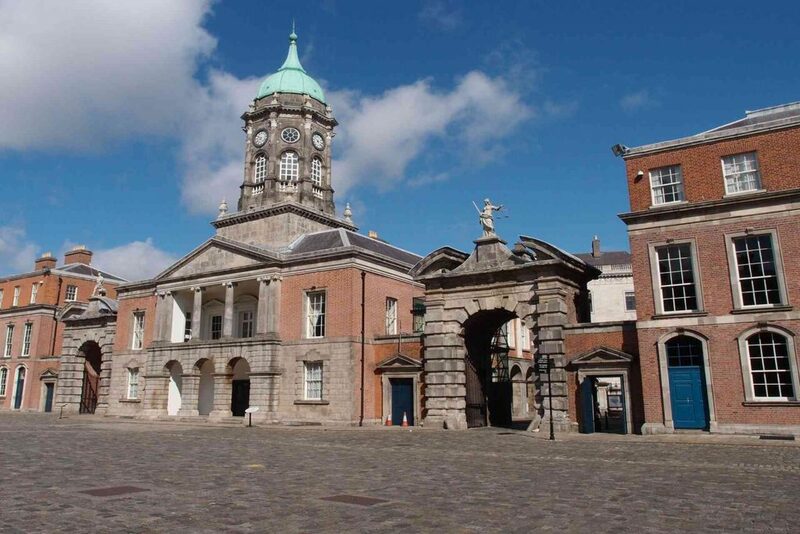 This tour will look at some of the set pieces of seventeenth, eighteenth and nineteenth century Dublin including Trinity College, the former Parliament House (now Bank of Ireland) and Dublin Castle. Briefly consider the varied layout of the college since its foundation in 1592 on the site of an Augustinian priory. The Old Library (completed 1729) still dominates, the small Printing House and the Dining Hall fitted into an older arrangement of squares. The west front, best seen in raking views forms one side of Parliament Square. Chambers contributed the layout and design of College Chapel and the facing Examination Hall and he also hinted at the possibility of opening up Parliament (Front) Square to Library Square. 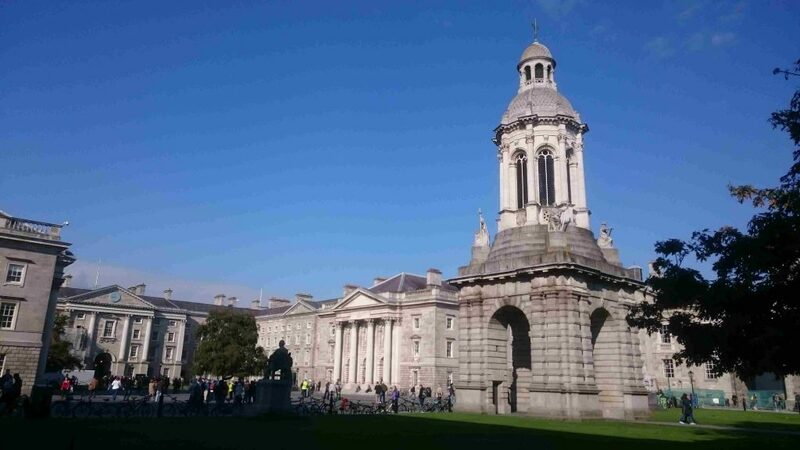 The Campanile of 1852 brilliantly punctuates and delineates the two squares. Finally the bejewelled casket that is the Museum Building contrasts with and is mutually enhanced by the brutalist Berkeley Library. Facing the west front of Trinity is the colonnaded piazza of the Parliament House. Designed by Edward Lovett Pearce in 1728, it was substantially complete in 1739. 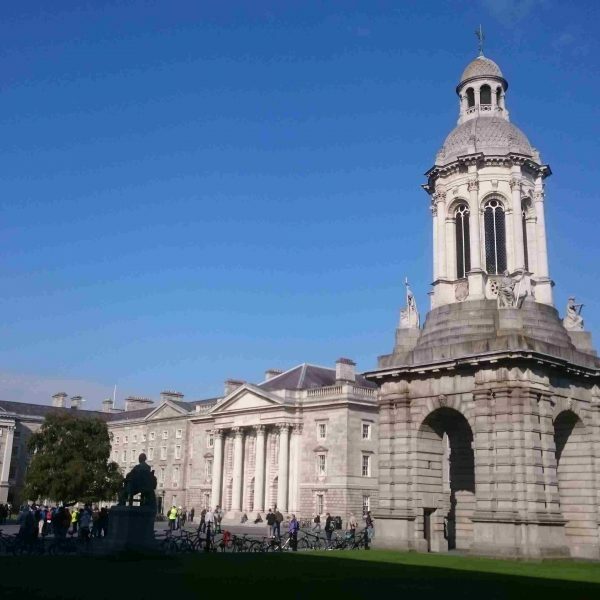 It was the first marriage of Portland stone and granite that was to become the characteristic combination for monumental Dublin architecture into the nineteenth century. The dome lit octagonal commons chamber is now gone, removed in Johnston’s radical, if sympathetic, conversion of the building to a bank in the early nineteenth century. Nevertheless characteristic Pearcean spaces survive in the apsed House of Lords and corridors, and Johnston’s banking hall is itself monumental. The Parliament House was the first major public building in the Burlingtonian style in these islands. The third building complex to be visited is the Castle. Elements of the medieval castle survive, most notably in the Record and Bermingham towers. A devastating fire in April 1684 might have been the impetus for a radical re-imagining of the castle, instead a prolonged building campaign started in the 1680s and continued to the 1760s. Both the Bedford Tower and the State Corridor show the long afterlife of the influence of Pearce in eighteenth century Irish architecture, seen in the Parliament Building. Johnston’s Chapel Royal in the Lower Castle Yard (1807-14) was truly innovative and widely imitated until superseded mid-century by simpler forms following Pugin’s demands for authenticity in materials. Again we see Johnston’s monumental classical work in the Banking Hall of the former Parliament.